Lake Mulwala | Marbella Marbella – Adelante! The Murray River is the longest river in Australia at 2.520 Kilometers from its source in the Kosciusko National Park it flows to the Southern Ocean through South Australia. Lake Mulwala was created in 1939 whilst building a dam across the Murray River between the towns of Yarrawonga in Victoria and Mulwala in New South Wales to provide irrigation water for the surrounding district. Crossing the Murray between the two towns was made possible by the building of the Mulwala bridge. The lake is a renowned fishery for the native Murray Cod and one of the few places where this Australian native fish is still reasonably abundant. 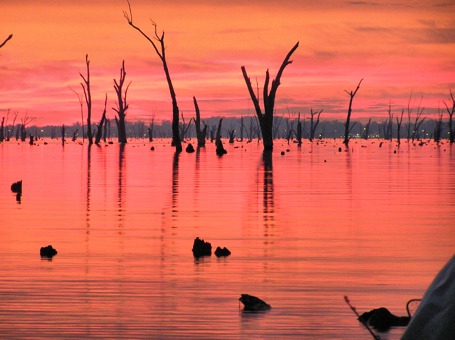 Lake Mulwala has many messages to tell about its changing moods. During the summer months it is a draw-card for the rich and famous. It is referred to as the crazy season by the locals. Vehicles towing boats three times their size invade the roads and parking bays. Local bakers bake bread rolls and pies through the night. The butchers prepare steaks chops firm breasts and tender thighs ! ready to cater for the crowds expected to pass through town the following day. There are no vacancies at the Bed and Breakfasts, the Motels and Hotels are fully booked. Luxury accommodation nearly always re-booked from year to year and is hard to find on both sides of the river and around the lake. Thousands of tourists flock to the foreshores to watch the fun and games developing on the water. 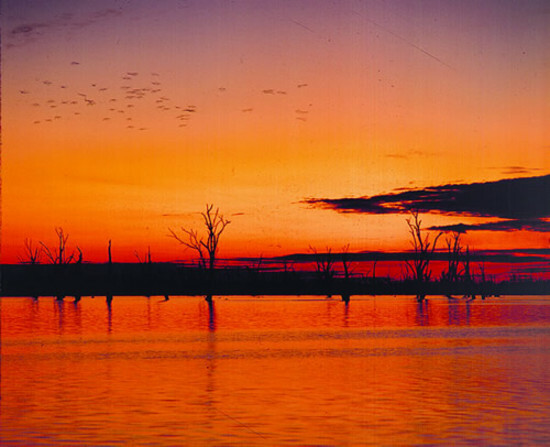 Lake Mulwala is a recreational haven for water based activities, water skiing, speed boat racing, and para-sailing. Tempers rise and fall as jet skies disturb the peace illegally racing to close to the waters edge. Police boats are always on the water, but never seem to catch the culprits. ‘The Paradise Queen’ paddle boat is a well known icon on the waters of Lake Mulwala taking tourists on daily tours. It’s paddles have been photographed for years by tourists from all over the world. The captain’s voice resonates through his loud speakers as he points out spots of interest, places to visit, and the amazing mansions of the wealthy, dotted along the foreshore of the residential area’s around the lake and along the river bank. 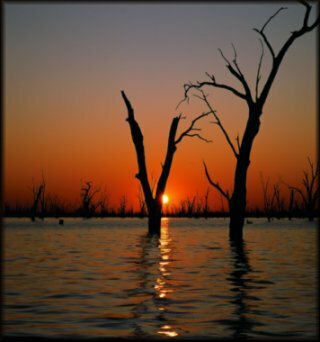 During the off season Lake Mulwala tells another story about its changing moods, a story of tranquil fishing. Dozens of faithful aluminum fishing boats ( tinnies ) loaded with tackle take to the water fishing for a Murray Cod. At dusk birds in pairs fly home to roost. ducks, swans and pelicans, glide on the water’s surface hoping for someone to throw them a piece of bread. As the sun sets the lakes moods change rapidly into a fan fair of changing colours. Hot reds softening to gentle pinks, bright oranges fading to yellows and gold dominate the skies, merging together on the horizon as the darkness closes in and they fade away, leaving streams of light from the Mulwala bridge and the neighbouring town of Yarrawonga reflecting across the dark grey- black ripples of the evening water of the lake. Traffic headlights can be clearly seen driving back and forth over the bridge from Mulwala to Yarrawonga visiting the night clubs which often have a firework display as the evening draws to a close. The blue flashing lights of local police conducting breath tests wait on the bridge for unsuspecting holiday makers driving home from the pubs, beer gardens and open air restaurants which are heavily booked into the early hours of the morning. The locals give that light a wide berth! The lake also has dark moods which lurk under the water, suckers of weed spread and rapidly take root in its bed, hardly noticed by the rich and famous, but a nightmare for the fisherman’s hook!! The council had a plan in place to drain the lake for three months during the winter period hoping to destroy the weed or at least hinder its growth. The water was drained from the lake leaving a carpet of green aquarium weed which when hit by the heavy morning winter frosts shrivelled up and died. The lake instead of being a place of colour and beauty looked painfully pale and ugly with dead fallen trees and the odd gathering of rocks dotted around. It looked like something out of space, however its ugliness hit the news headlines and created a huge tourist attraction. Coach loads of sightseers arrived to take photos and see the lake in its most daunting mood which only happens once in a blue moon. The lake was again allowed to fill with water during the months of July and August, with the water flowing freely again and restoring Lake Mulwala back to its full beauty and playground mood. As the water drained from The Mulwala Lake. plastic bags and fallen trees. Lay tangled in green aquarium weed. when the icy freezing frosts attacked. turning from green to deadly white. and turn the hole plan upside down. Allowing the weeds to multiply. Water gushed into Mulwala Lake. Murry cod escaped to a safer place. all a float with busy bees. Trawling for hours, no more snagging on weeds. Silently praying a cod needs a feed.